Number of teeths on gears and plates used in a spirograph determines the number of loops (also called points) of drawn shapes. 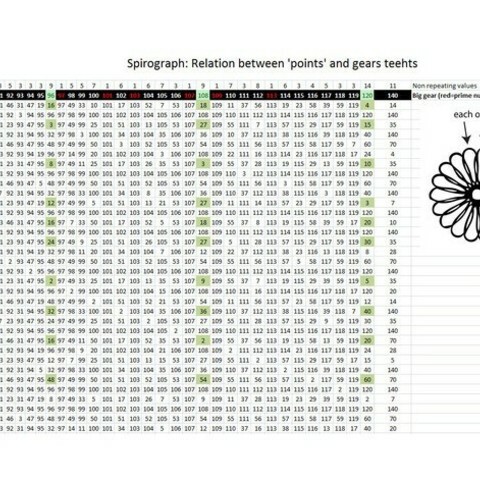 In the Spiro Machine files i've included a bunch of gears and plates but you may want to ry others configurations. Customizer creates gears and plates with any number of teeths. There's a relationship between plate and gears teeths so i also included a Excel file as a calculator for your custom gears. When you create a gear/plate set the number of teeths in plate determines the variations of shapes depending of gears teeths. Once you have some 'interesting' plates, look for gears that can draw nice shapes. 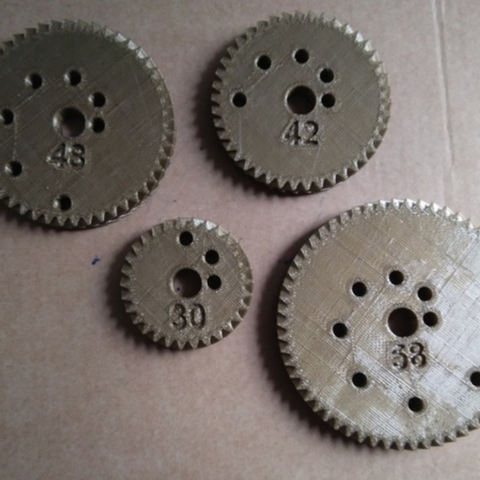 In the file uploaded i've highlighted the plates and gears that i've used for the Spiro Machine published. Mmmm....I don't know if i explained well. English it's not my native language and have big grammar lacks. Use comments for asking some doubts or things related to this. Hope you find it useful, explore your own variations and good luck!!! I've printed the main plate with -0.15 Horizontal expansion (in Cura), so the teeeths 'shrinks' a bit and engage is smoother.